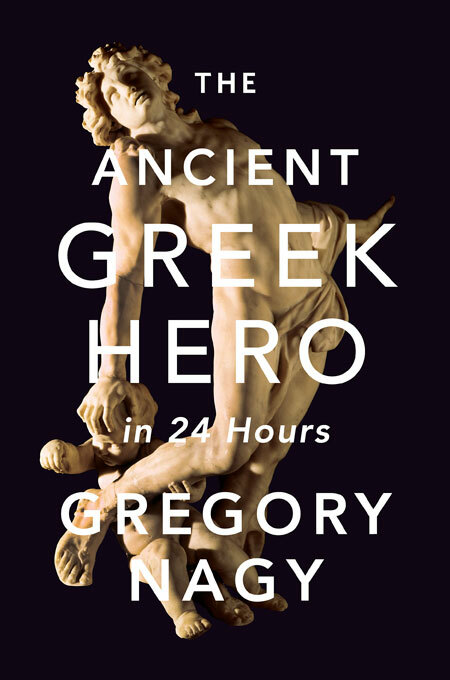 The time has come for Odysseus himself to sing his own epic odyssey, and the hero chooses to start with the most celebrated story of the Homeric Odyssey, about the blinding of the Cyclops. 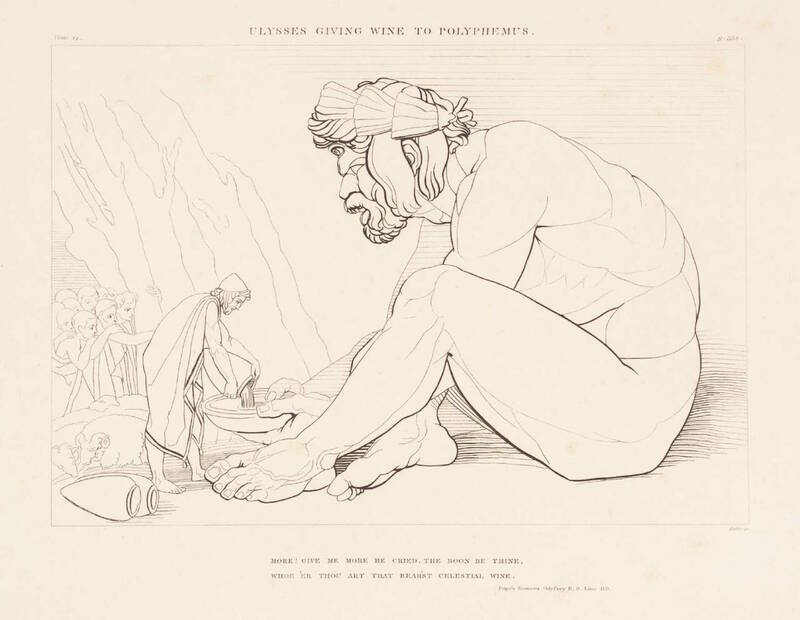 “Ulysses Giving Wine to Polyphemus” (1805). John Flaxman (1755–1826). Purchased as part of the Oppé Collection with assistance from the National Lottery through the Heritage Lottery Fund, 1996. Image via the Tate. |3 ἦ τοι μὲν τόδε καλὸν ἀκουέμεν ἐστὶν ἀοιδοῦ |4 τοιοῦδ’, οἷος ὅδ’ ἐστί, θεοῖσ’ ἐναλίγκιος αὐδήν. |5 οὐ γὰρ ἐγώ γέ τί φημι τέλος χαριέστερον εἶναι |6 ἢ ὅτ’ ἐϋφροσύνη μὲν ἔχῃ κάτα δῆμον ἅπαντα, |7 δαιτυμόνες δ’ ἀνὰ δώματ’ ἀκουάζωνται ἀοιδοῦ |8 ἥμενοι ἑξείης, παρὰ δὲ πλήθωσι τράπεζαι |9 σίτου καὶ κρειῶν, μέθυ δ’ ἐκ κρητῆρος ἀφύσσων |10 οἰνοχόος φορέῃσι καὶ ἐγχείῃ δεπάεσσι· |11 τοῦτό τί μοι κάλλιστον ἐνὶ φρεσὶν εἴδεται εἶναι. |3 This is indeed a beautiful thing, to listen to a singer [aoidos] |4 such as this one [= Demodokos], the kind of singer that he is, comparable to the gods with the sound of his voice [audē], |5 for I declare, there is no outcome [telos] that is more gratifying [khariestero-] |6 than the moment when the spirit of festivity [euphrosunē] prevails throughout the whole community [dēmos] |7 and the people at the feast [daitumones], throughout the halls, are listening to the singer [aoidos] |8 as they sit there—you can see one after the other—and they are seated at tables that are filled |9 with grain and meat, while wine from the mixing bowl is drawn |10 by the one who pours the wine and takes it around, pouring it into their cups. |11 This kind of thing, as I see it in my way of thinking, is the most beautiful thing in the whole world. εἴμ’ Ὀδυσεὺς Λαερτιάδης, ὃς πᾶσι δόλοισιν | ἀνθρώποισι μέλω, καί μευ κλέος οὐρανὸν ἵκει. I am Odysseus son of Laertes, and I, with all [πᾶσι] my acts of trickery, | I-am-on-the-minds-of [melein (μέλω)] all (πᾶσι) humans, and my glory [kleos] reaches all the way up to the sky. BA = Best of the Achaeans, Nagy 1979/1999. 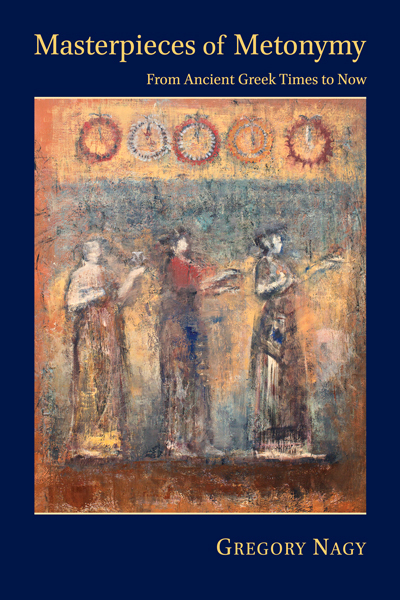 GMP = Greek Mythology and Poetics, Nagy 1990b. LSJ = Liddell, H. G., R. Scott, and H. S. Jones. 1940. A Greek-English Lexicon. 9th ed. Oxford. See the dynamic Bibliography for AHCIP. See the dynamic Inventory of terms and names for AHCIP.